Mike Griffin (far left) of Organic Valley welcomes our group to the Bordessa Family Farms organic dairy. CalCAN and Organic Valley hosted a dairy farm tour last week in Sonoma County to help inform state agency staff about dairy manure management strategies to reduce methane emissions (a potent greenhouse gas). The tour followed a morning workshop organized by CDFA to gather stakeholder input on the design of a new Alternative Manure Management Program (AMMP) that will launch this summer with an initial investment of $9-$16 million in grants to dairy producers for projects that reduce methane emissions. The workshop was attended by a dozen local dairy producers, CalCAN, Organic Valley and a number of other experts and stakeholders. When dairy manure decomposes in anaerobic conditions, such as in the manure lagoons found on many dairy farms, microorganisms (called methanogens) consume the manure and release methane, which has 72-75 times more global warming potential than carbon dioxide. Please refer to the CDFA website for background on the program. We joined hosts Mike Griffin, the California Pool Manager for the Organic Valley farmer cooperative, and owner-operator Gary Bordessa at his organic Ocean Breeze Dairy just north of Valley Ford, California. Gary Bordessa (right) explains how solids and liquids are separated through his “weeping walls,” after which the solids are composted and the liquids are recycled back into the system. Gary explained the manure management system he and his son designed for their 300 dairy cows. First off, the cows spend most of their time grazing on pasture, where their manure decomposes in aerobic conditions. This practice is a triple-win: it prevents the production of methane, it sequesters carbon in the soil, and it improves soil health, thereby increasing water storage and forage production. When the cows spend time in the milking barn or free stalls over the winter, their manure is flushed into one of three cement pits, where the liquid is separated from the solids through a low-tech, low-maintenance, and low-cost “weeping wall” made of wooden slats (pictured above). The solids are composted and spread back on the pastures, while the liquid is captured in a lagoon and recycled to flush the system again. Though the Bordessa operation already emits less methane than most conventional dairies due to its extensive use of pasture, Gary is considering experimenting with aeration and bacterial inoculation systems in his small lagoon to further reduce methane and other air pollutants. Mike Griffin and owner-operator Garry Mahrt welcomed us to Gillian’s Dairy, a 220-head organic dairy just west of Petaluma. Garry started by telling us that a conventional flush system would never work on his property because of its steep grade and the challenge of creating a large lagoon. Garry worked around this challenge in two ways. First, like the Bordessa’s, Garry’s herd spends the majority of its time on pasture. Second, when his herd is not on pasture during the rainy winter months, the cows are sheltered in a compost pack barn. Garry Mahrt explains the benefits of his compost pack barn, which include reduced methane, improved cow health, and composted manure for his pastures. Compost pack barns can reduce methane emissions by composting the manure in place with a high volume (2-4 feet) of dry, carbon-rich bedding material such as sawdust, wood shavings, or rice hulls. To mix the materials and continue to aerate them, Garry tills the material daily with a small tractor and rototiller and adds additional bedding material as needed to maintain the most beneficial carbon to nitrogen ratio. The first two things our group commented on were the cushiony texture and pleasant, earthy smell of the bedding – both the natural result of well-made compost. Compost pack barns, like pastured grazing, achieve multiple benefits: they decrease methane production; they divert and compost multiple agricultural and/or forestry waste streams, which are then sequestered in the soil; and they improve cows’ comfort and hoof, leg, and immune health because of the soft, spongy texture of the bedding. Our group asked Garry questions about tradeoffs with other systems, technical aspects of the composting process, and plans for improvements. 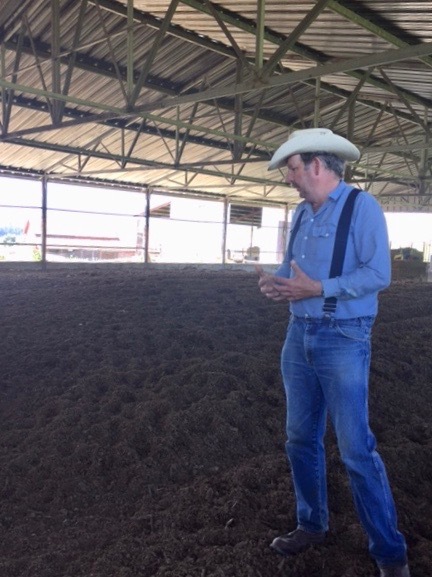 Garry noted that the three main tradeoffs are that cows require more space in a compost pack barn than in conventional barns, that turning the bedding every day requires additional labor and fuel, and that it can be challenging to source affordable and local bedding material. In terms of improvements, he outlined two: 1) to experiment with different ratios of sawdust and rice hulls and 2) to retrofit the barn with a forced air vacuum system underneath the bedding, which could aerate the compost more consistently and reduce the labor and fuel he currently uses to turn the bedding every day. In the workshop and on the tour, it was clear that the experiences and innovations of dairy producers are critical to the design of a successful AMMP program. Agency staff expressed their appreciation for the opportunity to visit these farms, and we are grateful for the leadership of these producers and many others who constantly strive to improve their environmental stewardship practices while running viable businesses. CDFA is accepting comments on their AMMP program until May 8th (email cdfa.oefi@cdfa.ca.gov to provide your input). CalCAN, in partnership with Sustainable Conservation, Carbon Cycle Institute, Marin Carbon Project, and Organic Valley/CROPP Cooperative submitted a joint comment letter on many of the proposed elements of the program, which can be seen by clicking here. CalCAN and these groups will continue to collaborate with CDFA and ARB as they design this new program. Hungry to learn more about dairy methane reduction strategies? Read CalCAN’s Dairy Case Studies on Reducing Methane Emissions and 2015 Diversified Dairy Methane Strategies Report.